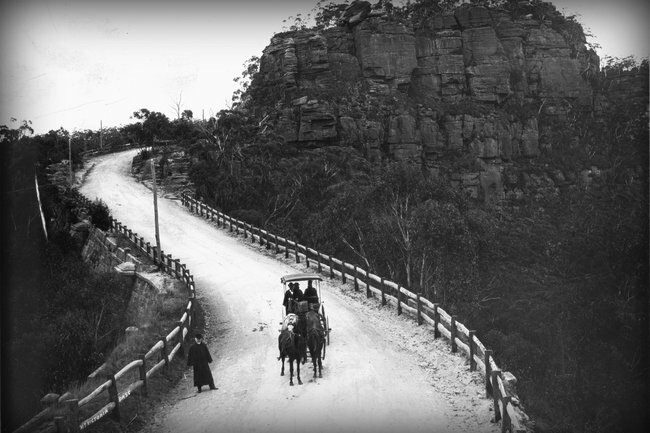 Victoria Pass ghost: Who is the Blue Mountains' Lady in Black? At the peak of the Blue Mountains, west of Sydney, a road snakes above bushland, dropping away at each side into a forested gully. Cars careen through here, supported from beneath by a sturdy, stone causeway, built by convicts close to 200 years ago. The Victoria Pass is a piece of NSW heritage, an engineering marvel. But it has a dark past. This snaking stretch of road serves as the setting for one of the region’s most horrific crimes; one that has carved a place in local folklore, and sparked the urban legend of “The Woman in Black”. These are the opening lines of a poem published in 1891 by the legendary Sir Henry Lawson. Called The Ghost at the Second Bridge, it described his claimed encounter with an apparition two years earlier, one many have claimed to experience on the Pass both before and since. According to the legend (of which Lawson was all too familiar as he traversed the area with his friend that evening), the figure of a young woman, dressed in black, would appear to travellers late at night. Its eyes were fixed on me. And glistened in the light. Who is ghost of The Lady in Black on the Victoria Pass? While stories about a ghost will surely raise a skeptical eyebrow or two, there is a haunting truth to the tale. The savage murder of a 13-year-old girl named Caroline Collits. Caroline’s short life was one marred by tragedy. She was one of six children, to parents Mary Hopkins and William James, who ran an illegal liquor shop west of the Blue Mountains. Mary, an alcoholic, died by suicide in 1835 when Caroline was just eight. After suspicions were raised that William may have played a role in her death, he was arrested, convicted and sentenced to death by hanging. But before the execution took place, the conviction was overturned on a point of law, and William walked free. As the podcast Forgotten Australia recounts, it was too late for Caroline and her siblings. They’d been left to fend for themselves on their Bathurst-region property; they had little food, and her newborn brother had perished. According to the podcast, Caroline and her younger sister, Mary, were sent to work as servants for the Collits, a respectable local family and proprietors of the nearby Hartley Inn. It was there, around 1820, they met John Walsh, a freed convict who groomed and had a sexual relationship with both girls – then aged just 10 and 12 (the latter being the age of consent at the time). Maria ultimately married him a year later, while Caroline married the Collits’ 25-year-old son, William. Deeply unhappy in her marriage, Caroline left him for a time and went to live with Maria and John, with whom she continued a bizarre affair. In 1842, the Blue Mountains Library notes, it seemed there was hope for a reconciliation. John, Caroline and William met at a tavern near Hartley for drinks, but on the return trip the men tousled, and as John picked up a rock to strike William, Caroline urged her husband to flee for his life. He did, leaving the pair behind. Early the following morning, the bloodied body of a teenager was found by a postman at Victoria Pass. She’d been raped, beaten, her head struck with a rock, which lay covered in blood nearby. That teen was Caroline. John Walsh had returned the previous evening, claiming to have been attacked by son of the tavern owner, Joseph Jagger, whom he said abducted Caroline. But witnesses placed the Jagger boy at the tavern all night. John was arrested, convicted, and hanged at Bathurst on May 3, 1842. The Collits name is still well known in the Blue Mountains area. Collits Inn is a heritage-listed venue, that now serves a function centre. But it’s Caroline Collits’ tragic story and tales of her ghost – The Lady In Black – that have captivated locals and visitors. Reported sightings are said to be scarce these days. The road has long since been upgraded and widened over the original. But according to a 2015 article in the The Daily Telegraph, truck drivers would still occasionally claim to see her; especially on cold nights, when the threat of black ice would force them to travel slowly along the Pass. White face, black dress, pleading.